As a popular visitor destination there is plenty of accommodation of all types to suit every budget. 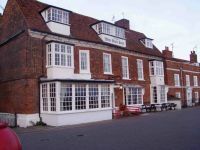 Many of the Public Houses in Burnham offer accommodation, some of which like the White Hart pictured above offer River Views from their rooms. For more informal stays there are bed and breakfast houses or even more informally there are cottages to rent. For outdoor types there are two camping sites for tents or caravans. The Maldon District Tourist Information site provided an updated accommodation guide detailing all of the above accommodation though which you can check availability. Many visitors use online guides such as Trip Advisor to check out places to stay . If you do this then please remember that some places that are shown as nearby are actually the other side of the River Crouch which would mean a 60 minute trip by road to cover the 6 miles by direct line so carefully check the map for anywhere that you book.